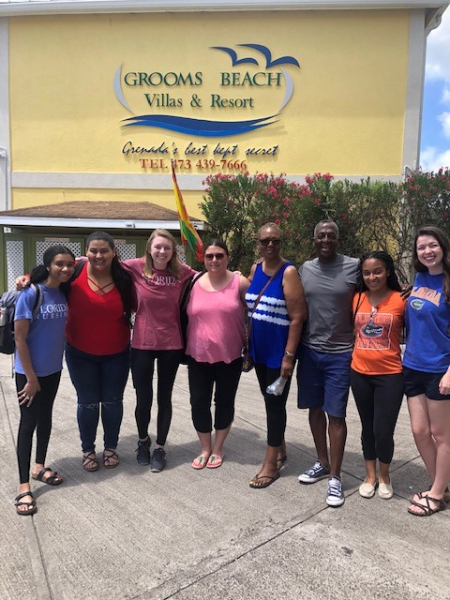 Grenada study abroad 2019 participants before the trip. A group of six University of Florida College of Nursing BSN students will spend their spring break in the Caribbean. 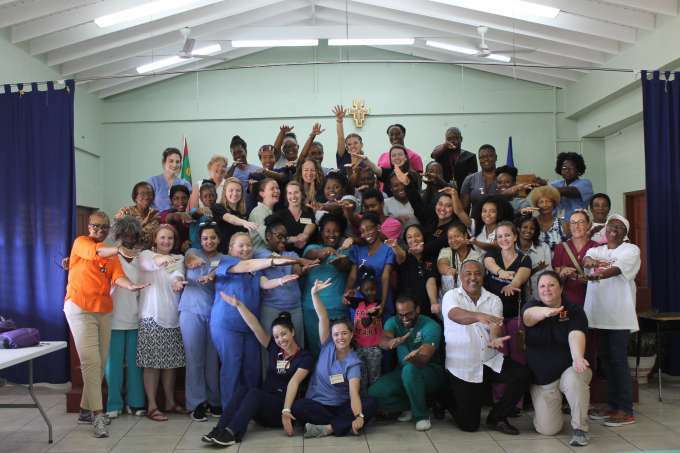 Led by Dr. Paula Delpech, the Gator Nurses hit the road for the island of Grenada March 1 for the nine-day educational service trip. 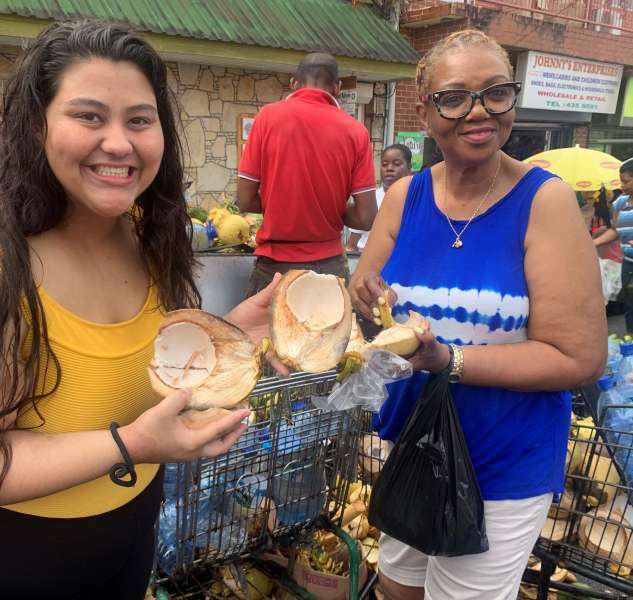 Delpech, a native of Trinidad, boasts research and scholarship interests that include international service learning, global health and health disparities, with an emphasis on the Caribbean and the Caribbean diaspora. The students will be blogging and sending pictures all week as they take in the enriching educational opportunity of a lifetime. Follow their adventures here! 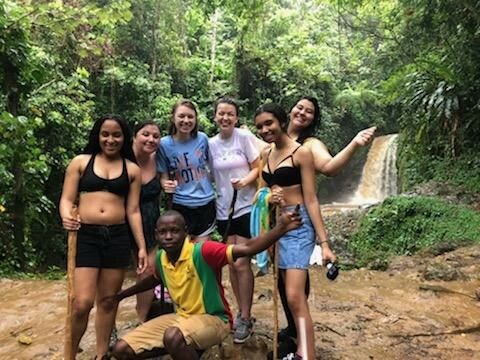 Although we are only a small group of students, we have been anticipating this spring break trip to Grenada all semester. As many of us love traveling, we were excited to see that there was a study abroad opportunity through the College of Nursing. 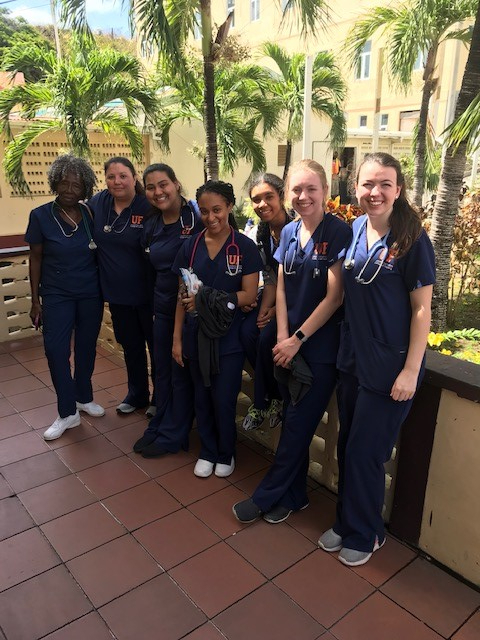 We wanted to explore the vast opportunities that nursing as a field has to offer; going overseas gives us an insight of how health is perceived by other cultures. As we started our semester, everything lined up perfectly for us all to meet and collaborate in preparation for our upcoming trip…As if! If nursing school has taught us one thing it is being adaptable. Just kidding… if anything, it’s safety. Always patient safety! All jokes aside, it was actually difficult to get our schedules to line up in order for us to meet ahead of time. We would think we had found a good time to meet, but there always seemed to be some conflict. After many emails, we were finally able to sit down together, and Monday mornings became our time to get together and prepare. 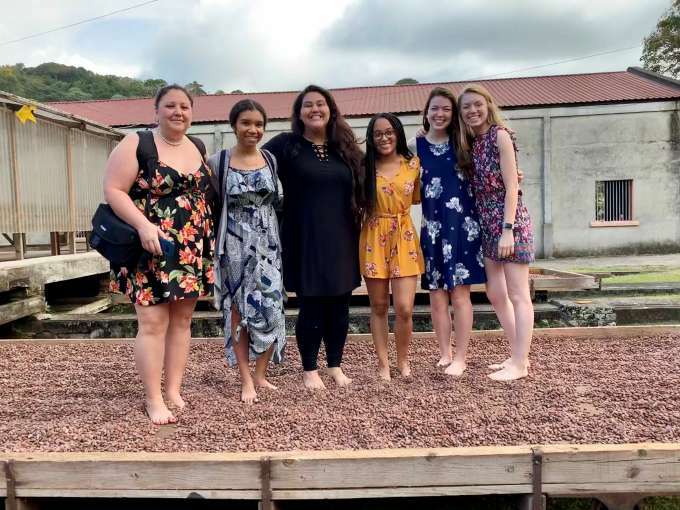 Study abroad is so much more than just an awesome nine-day trip to the Caribbean, so we had several assignments before departure. We were able to examine our own values, learn cultural differences and research various topics. While we were each given specific topics of health to learn about. We all researched breast cancer and practiced how to teach breast self exams with models in class. 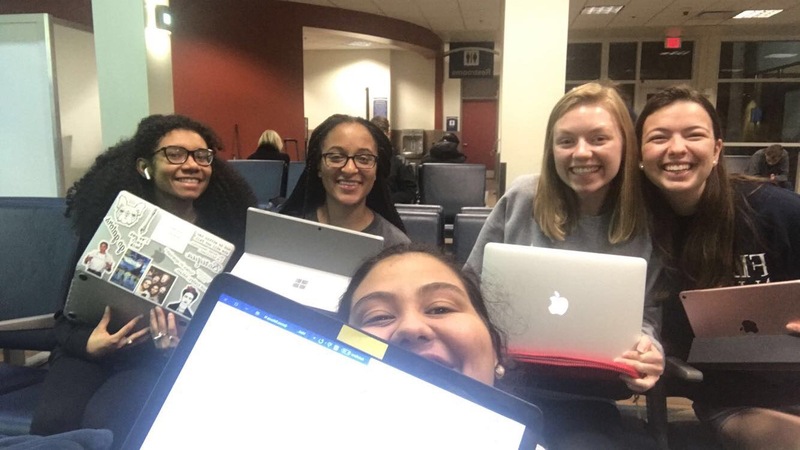 With spring break quickly approaching, we were finishing research, editing pamphlets and collecting donations of dental supplies, not to mention studying for our midterm…which we all successfully passed!! Last Tuesday, we all met in a conference room in HPNP to divide supplies. 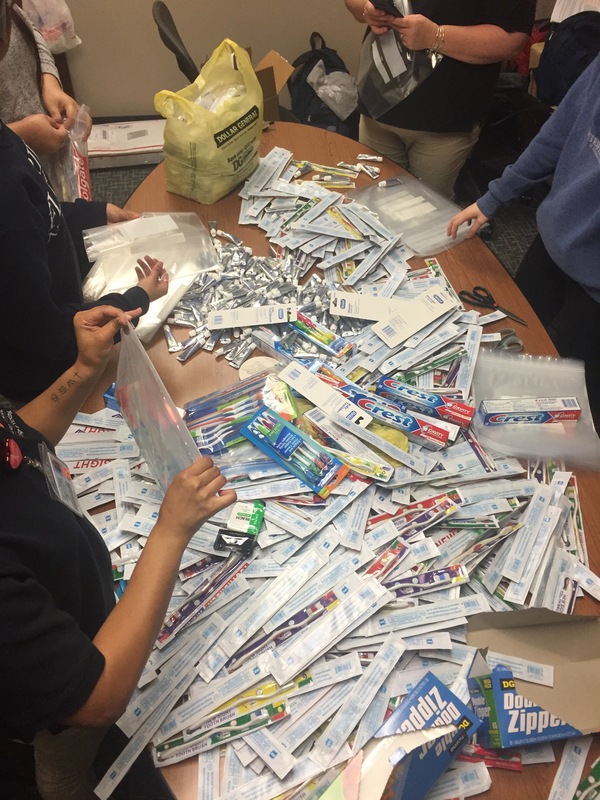 We bagged toothbrushes, toothpaste and dental floss to be able to hand out to people at our health fairs. We were flooded with donations that will be a blessing to locals in Grenada. During that time we also had to divide up the general supplies like glucose meters, biohazard bags and hand sanitizers, as we had to bring all of the supplies for the health fairs. Relaxing at the beach before our first health fair! 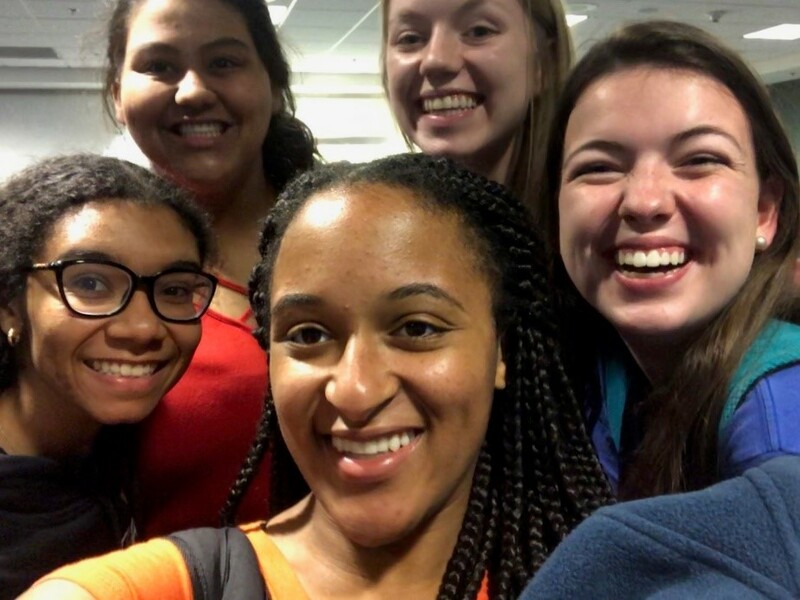 This morning (Friday) five of us flew out of Gainesville to meet up with everyone else in Miami (and we took the opportunity to study in the airport!). The flight was originally overbooked, which made it stressful to make sure everyone got a seat on the plane. Luckily, everything worked out! We had a great flight out of Miami, and were able to arrive in Grenada in time to go to the beach and watch the sunset. After the beach, we went to the local supermarket to pick up a few things, and then went to a little ice cream shop. Most of us tried their nutmeg ice cream, as nutmeg is one of the major exports of Grenada. We are looking forward to experiencing more of the culture of this country. We are currently sitting by the pool going over materials for our first health fair tomorrow. We are really excited to be able to have the opportunity to be here, and ready to start a great day bright and early tomorrow! To kick off our first full day, we were woken by the sounds of roosters crowing and energetic Caribbean music playing. We all arose and ate breakfast on the patio, where we had a delicious buffet of pancakes, bacon, eggs, bacalao, bread, fruit and, of course, freshly ground Grenadian coffee. We then loaded our supplies and were on our way to our first health fair of the week in Gouyave. Garfield, our driver, loaded all of us up in his taxi and off we went. Despite some of us having some motion sickness from the continuous twists and turns of the Grenadian roads, the views from the window were amazing and Garfield assured us that we were in great hands, and his driving skills were in tip-top shape! 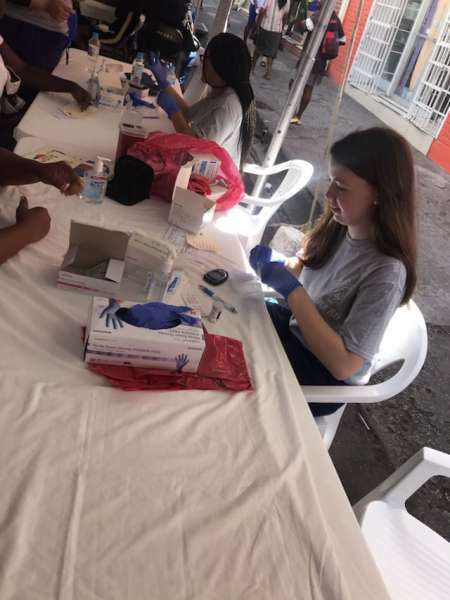 Once in Gouyave, we set up the health fair with a blood pressure station, glucose check station, education area, a breast examination area and a crafts station for children. 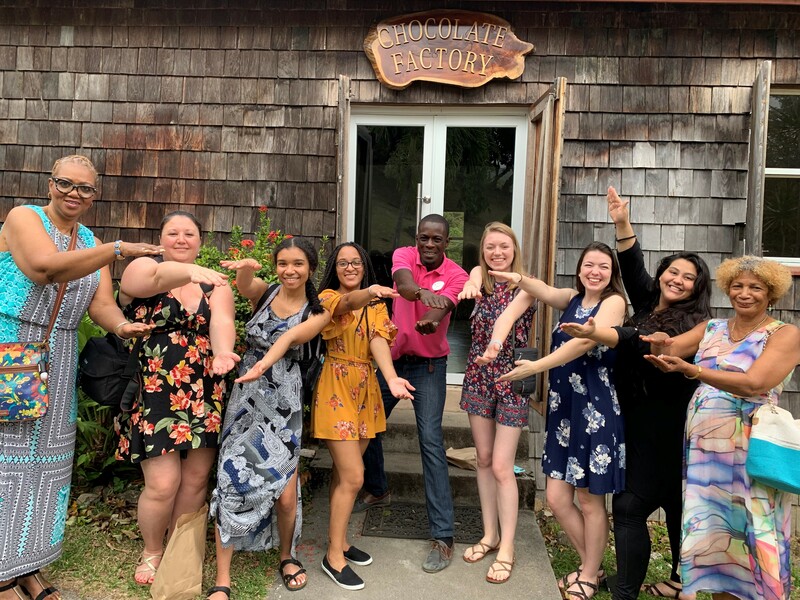 While setting up for the fair, we were paired and greeted by nursing students from Grenada that attend St. George’s University and nurse practitioner students from Boston. The next few hours we all rotated checking blood pressures, blood sugars, performing breast exams and educating patient on various aspects of their health ranging from diabetes, ovarian cancer and hypertension. After about two hours, we decided to walk around town and draw more people to the health fair. Everyone we spoke with were extremely friendly and intrigued by the health fair. 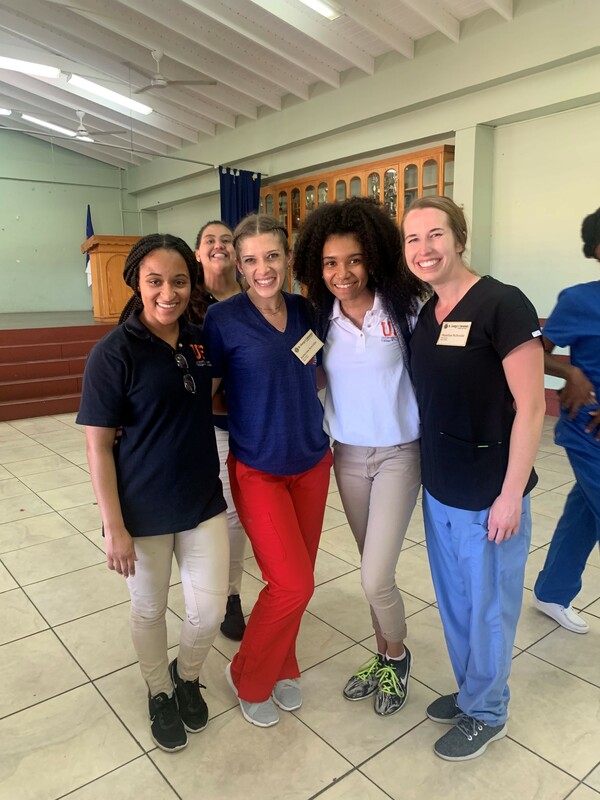 While in the health fair we were separated and paired with the other students from the various schools and learned a lot about the nursing program here in Grenada and the culture on the island. At the end of the health fair, we formed a big circle with all of the students and professors and debriefed about our experiences from that day. We all had learned something new that day, whether it was a new way to examine breasts or alternative language to use while communicating with patients. All of us students were appreciative of working with each other and felt as if we all have learned something from each other. After a long day at the health fair, we drove around town and made a stop at a lighthouse where we walked up a hill and enjoyed the outstanding view of the ocean and homes along the shore. This morning was off to a slow and relaxed start. We were able to sleep in a little bit and then enjoyed a wonderful breakfast outside at the hotel, where there was a perfect breeze! Shortly after breakfast, we hit the road to visit the Belmont Estate in St. Patrick, which was close to two hours away from where we were staying. The trip there included holding our breath several times as we rounded curves along the edge of the mountain (at one point, we reached 1,910 feet in elevation! ), but we knew Garfield (our driver) wouldn’t let anything happen to us. It is quite an adjustment, however, to get used to the driving here; they drive on the opposite side of the roads from the U.S., there are barely any traffic lights (we’ve only seen one so far), there are no marked lanes and a lot of people walk in and along the road. Even so, we made it safe and sound! 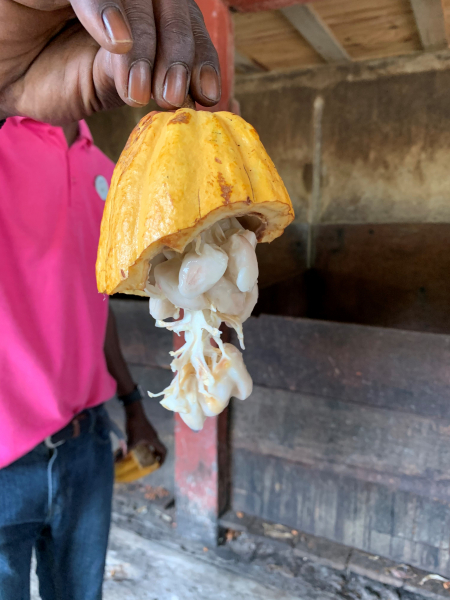 Fresh cocoa beans in the seed pod. When we arrived at the Belmont Estate, we were seated to have lunch. For appetizers, we were given the choice of pumpkin soup, split pea soup or stuffed yams. The main course included a buffet of their traditional fish, chicken, savories and local vegetables, and it was delicious! Live music was playing, which was so fun and had us all dancing at some point or another during our meal. For dessert, we could choose between chocolate cake made from their own organic chocolate, cinnamon ice cream and nutmeg custard, but we ended up sampling a little of everyone’s and each one was so rich and tasty! Our group with the estate tour guide outside of the chocolate factory. take our shoes off and try it for ourselves, so, of course, we did! We also got to try a 100% cocoa bean, and it was much more bitter than our normal chocolate at home. We also were taught the process of taking the nibs from the beans and using that to make chocolate, and there was a lot more to it than I had originally believed. At the end, we were able to sample their special cocoa tea, which was made with a cocoa ball, nutmeg, cinnamon and milk, and it was incredible! After our tour, we headed back to the hotel and did some swimming, studying and grabbed dinner together. We all had such a fun and amazing day; we can’t wait to see what the rest of the week has in store for us! This morning we arose bright and early to get ready for a day filled with educational activities. Shortly after breakfast, we organized our supplies for the day and quickly got them packed into our bags. We eagerly hopped into the bus and were on our way! One thing that immediately caught our attention was how the roads were much busier today. We saw many school children in their uniforms walking along the side of the road. Our interview at the Grenadian radio station. A short ride later, we arrived at the first stop on our agenda, a radio station. Before coming to Grenada, we prepared specific health topics that we would be talking about during our time here, and we were given a wonderful opportunity to have our message broadcasted throughout Grenada. Although our composure said otherwise, we were feeling very nervous! However, soon after starting, the nerves melted away. We all took turns talking about breast cancer, ovarian cancer, prostate cancer, adolescent health and the HPV vaccine. Our main take-away message was for people to get comfortable with their bodies and to not be afraid to go to their health care provider. As our radio host said, “Our country’s health is our wealth,” and we could not agree more with that statement. Health promotion is key! Becoming local celebrities on a Grenadian TV station! 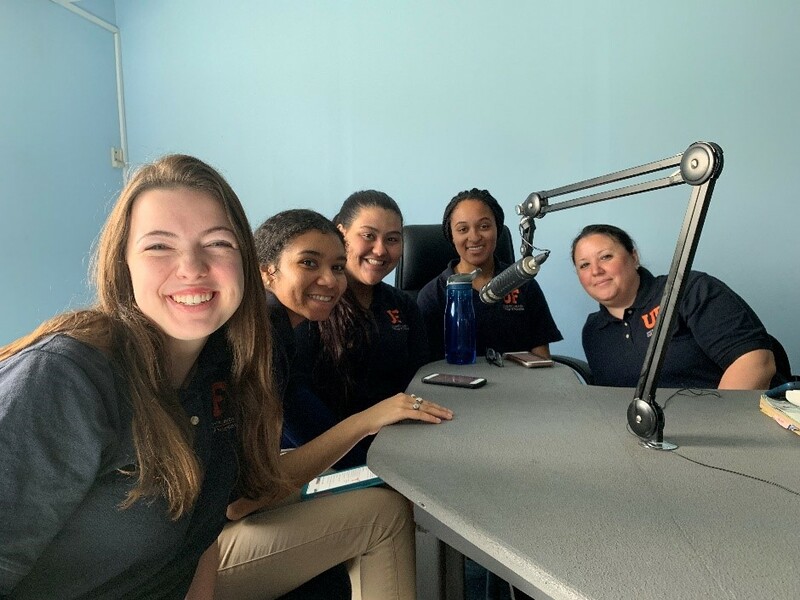 If talking on a radio station wasn’t enough to get the ball rolling, we then drove to a TV station to talk more about the HPV vaccine. We provided essential information about HPV and the Gardasil vaccine. In fact, the host of the TV broadcast was so intrigued, that he led us into talking about the other health topics that we discussed earlier during the radio show. As nursing students, we are taught to adapt and overcome, so although we hadn’t prepared to do that, we seamlessly switched to those topics. We had a wonderful discussion filled with a little bit of humor, and it was a great way to get the message to more people. After the television broadcast we headed off to grab lunch. We drove through narrow, winding streets filled with vibrant shops and businesses. Eventually, we stopped at a restaurant called “Creole Shack Restaurant” located by the marina and cruise ship port. As we walked inside to order some delicious Grenadian food, we noticed quite a few people staring at us. We attributed it to the uniforms we were wearing until a woman said, “Are you the people that were just on TV?” Within such a short amount of time, quite a few people had recognized us, and we were basking in our minimal celebrity status. After taking in the beautiful view of the water and eating until our bellies were full, we headed over to Ms. Hopkin’s house to pick up some additional supplies for a small health fair that we were doing with the Grenadian Disabilities Association. Setting up for screenings and patient education! Our final activity for the day was to do screenings and patient education for people with physical and mental disabilities. 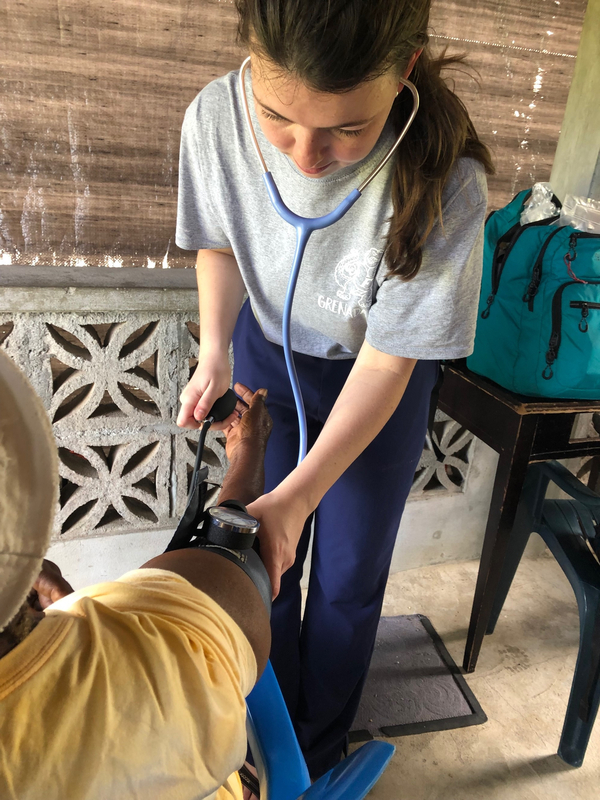 When we arrived, we set up several stations for blood pressure, blood sugar and patient education, which included tips for dental hygiene, exercise and hydration. Interacting with these individuals was truly a great experience. They were so thankful and happy for what we were doing. It reinforced many essentials of nursing. No disability is exactly alike, so we had to adapt for every individual, and it brought out the value of patience and compassion in us. Tomorrow we have another exciting day where we will be shadowing nurses at St. George’s Hospital; we are looking forward to it! Our group in front of the St. George’s General Hospital. Up before the morning sun we rushed to put on our scrubs, quickly grab our stethoscopes and swiftly found ourselves on the road, yet again, ready for an adventure. We started our journey to the St. Georges General Hospital, where they kindly welcomed us into their units. This was a 20-minute car ride from where we have been staying. 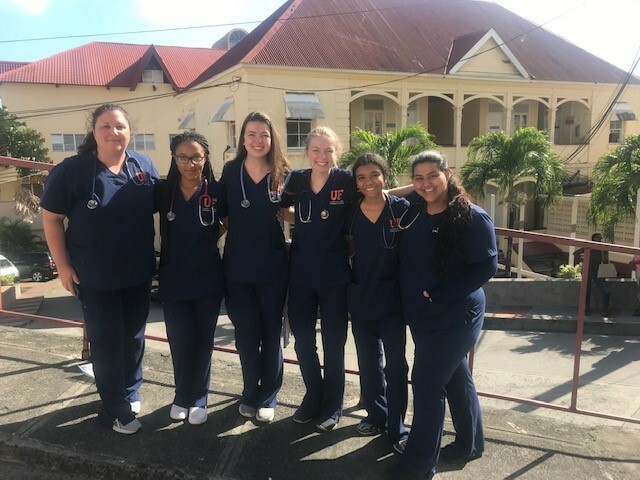 Despite our exhaustion our day was quickly brightened up by the sight of the hospital and knowing that we were getting treated with shadowing some of Grenada’s finest nurses. We were received by the hospital’s director of nursing, who led us on a hospital-wide tour. The hospital is set up in a ward style, where there are about 30 beds in the ward, separated by curtains, and a set of nurses assigned to each ward. No two bed areas are the same, and patients are allowed to utilize their own bed sheets and clothing. We observed that, due to the proximity of the beds, the patients grew close and began to form relationships. And as nurses, we understand the great role that relationships and support systems have on an individual’s heath. It was nice to see the teamwork amongst the nurses, especially because their case load was so heavy. One of us shadowed a nurse who had 30 patients! Let’s just say it was an eventful experience. Experiencing this nurse-to-patient ratio inspired us to be adaptable, organized and optimistic. 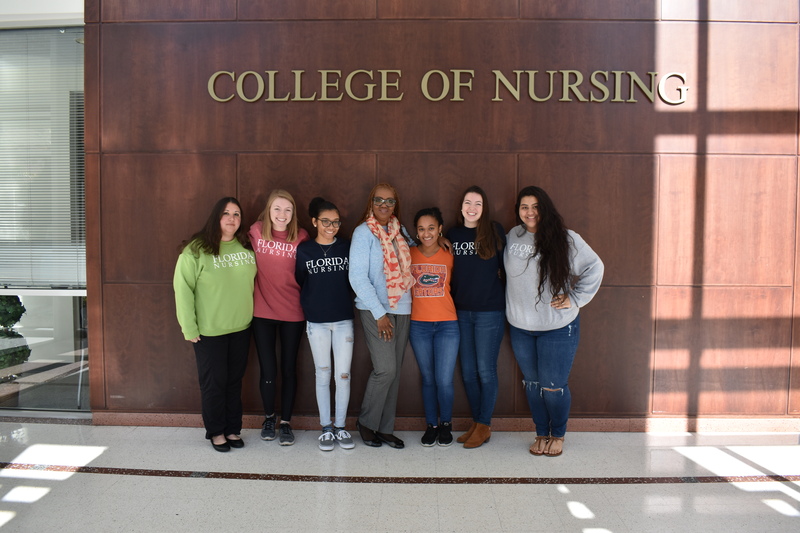 Our group with St. George’s General Hospital’s director of nursing. One really interesting thing that one student was able to experience firsthand is that the nurses in Grenada act as EMTs who go out into the field on an ambulance. It was a fast, bumpy ride and, at times, it was completely standstill. 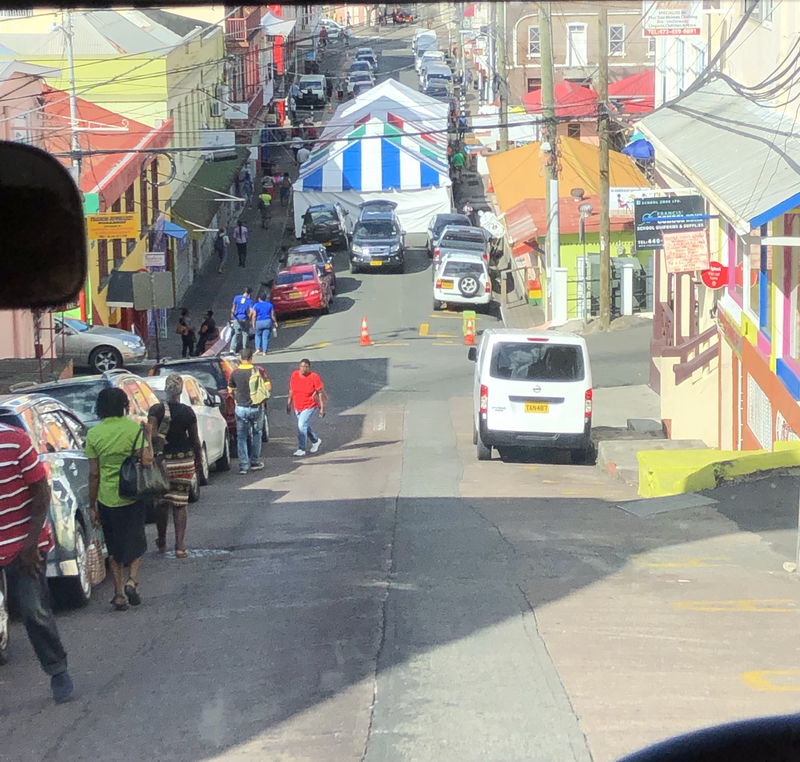 Since the roads in Grenada are narrow, the ambulances sometimes encounter difficulties getting through if there is a traffic jam. I would equate the width of the roads to a one-way road in the states, if not smaller; however, in Grenada, these are utilized as two-way streets. After the impactful, learning experience we had at the hospital, we met up with Gator Nurse senior Jenna Schuppener! 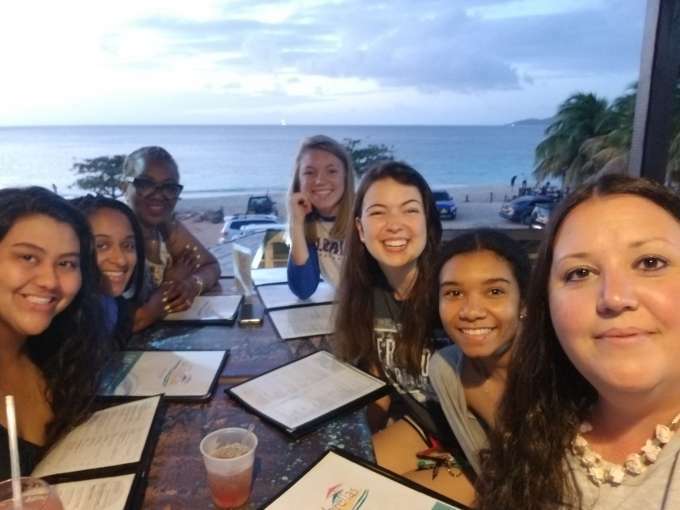 Jenna participated in the Grenada study abroad trip last year, and decided to return again this year on her own! We had the opportunity to join Jenna in delivering toys to a 2-year-old boy who has Cornelia de Lange syndrome, which is a genetic disorder that causes physical and intellectual disabilities. Last year, Jenna became very close with this little boy and started a project to collect developmental toys for him. We witnessed such a special moment when Jenna delivered these toys and heard about the value it will have on his development. True admiration goes out to Jenna Schuppener, who saw a way to help and decided to make it happen. It is a true demonstration of patient advocacy and compassion. Today, we started with a full breakfast on our lovely open-air deck by the pool and our Caribbean view. We filled up on fresh Grenadian juice, bacon, fresh local fruits, toast, fresh eggs and bacalhau. Bacalhau is a local dish of salt fish and fresh vegetable and we are all loving it, well…some of us are and it is still growing on the others. We then loaded the bus with backpacks of medical supplies and headed on a 1.5-hour drive through the beautiful rainforest. Driving through the rain forest. One thing we love about Grenada is not needing air conditioning on our drives. We just open the windows of our van/taxi, pull our hair back and off we go. However the rain forest provides such a nice coating of humidity and cool layer of air that we all just enjoy the cool breeze on our face. After a long and winding drive through the cane fields, palms and heavy flora, we arrived at the Golden Years Centre, a recreational center for seniors who meet every Wednesday. The employees and members of the center started the day with hymns, prayer and reading Psalms. 90:1-12. We then began an educational symposium leading in topics of breast cancer, ovarian cancer and prostate cancer. One lady stood up and told her story of breast cancer and the importance of what we had taught…get your exams no matter your age and go to your annual checkups! Next, we provided blood pressure and blood glucose checks for the members, gave them cards with their readings to take with them, and they were served lunch while we finished up. We also gave everyone toothbrushes and toothpaste and shared with them the importance of dental health. We then had the pleasure of entertainment from our guests! One lady writes moving poetry, one sings a beautiful hymn and one is a true comedian. Members of our group delivering breast cancer education. We were in for a big surprise though. The Golden Years Centre and Minister Bain donated and cooked us a traditional Grenadian meal for lunch. 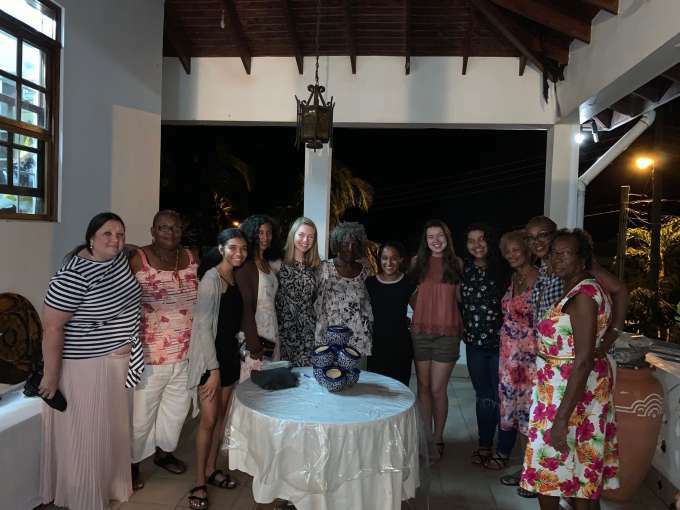 We were served a feast of bread fruit, callaloo, swordfish, chicken, cooked carrots, sliced tomatoes, bread dumplings, fresh juice and sweet bread. Callaloo is when they cook the spinach in coconut milk and add spices, and sweet bread is fresh-baked bread with mixed local fruits. It was all very delicious. We thanked the center employees and Minister Bain, and we also taught Minister Bain the Gator Chomp!! Not to mention, all this is taking place in an open-window and airy one-room community center on the side of a mountain, with the rainforest as one view and the ocean as the other. It was absolutely gorgeous and the people were amazing! It was a once-in-a-lifetime experience, and we were so grateful to be a part of this day and the beautiful culture here. On the way home, we stopped at a local fish market. We got to see how the salt fish is dried in the sun and how fresh fish is bought by the locals. 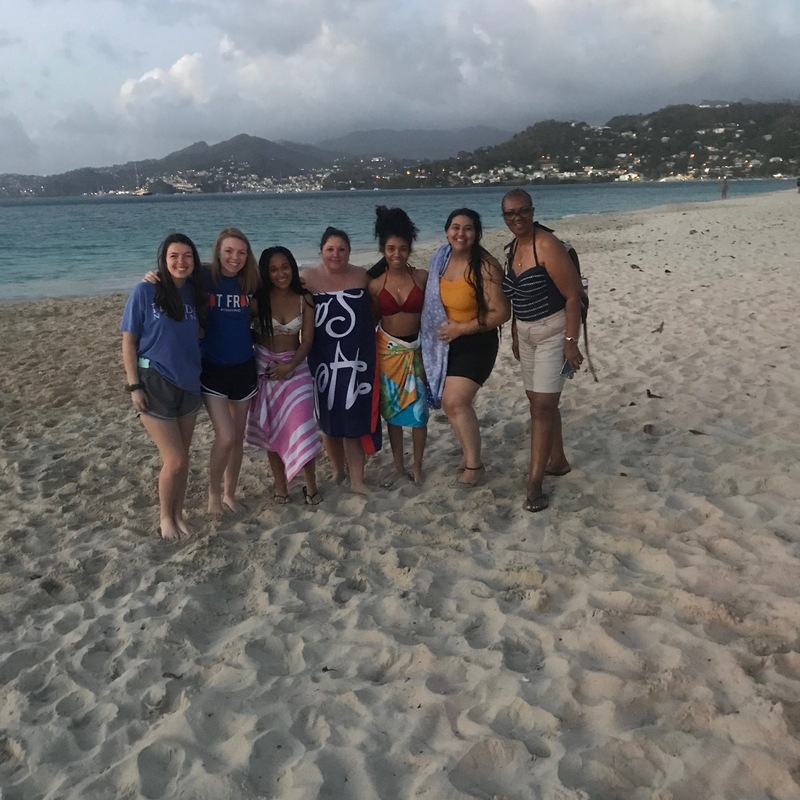 After arriving back at the hotel, we all headed to the beach for few hours of swimming in the crystal clear Caribbean waters. It was a refreshing break to our day. Swimming, sunning, seaglass hunting, conch finds, good conversations and underwater pics are just a glimpse of the much-needed relaxation and fun we needed midweek. 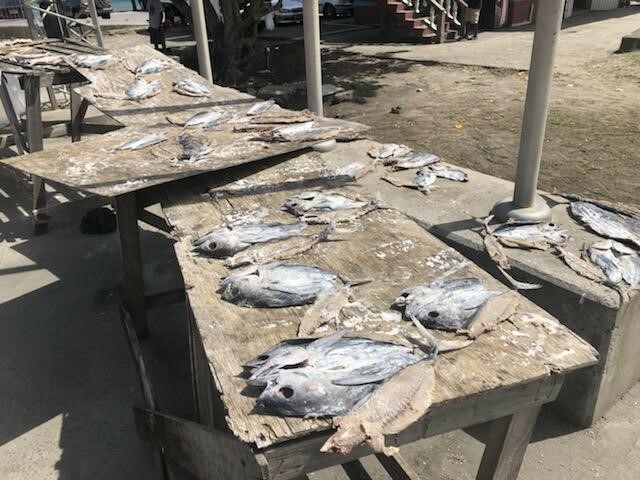 Salt fish drying at the fish market. This evening, we loaded the van and headed over to True Blue for Street Food Wednesday. Here, you can buy tickets for food and then choose from multiple vendors. We feasted on lobsters, red snapper, seafood pasta and nutmeg ice cream to name a few. We enjoyed our meals just steps from the Caribbean moonlit waters. After dinner, we debriefed about our midterm success thus far. Afterward, we headed over to the other side of the docks for some live music. It was a great day and evening for both serving this incredible community and leisure. It is safe to say we are in love with Grenada! Our group exploring local foods at True Blue. A view of the health fair. Today we were able to help with a health fair in St. Georges. There was a lot of preparation that went into this, and we have been looking forward to it all week. Several of the activities we have done while in Grenada were designed to help lay the groundwork for this health fair. 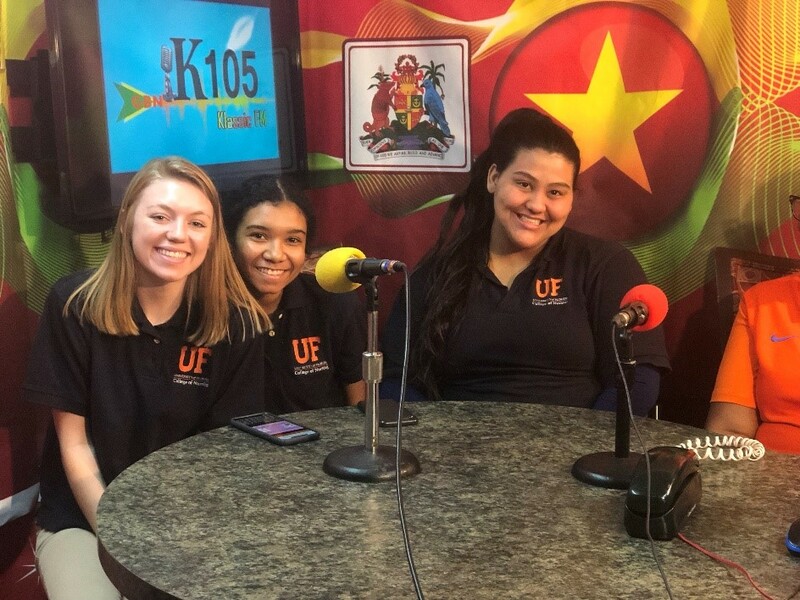 For instance, after we were able to share health education on the radio and television, we took that opportunity to advertise. It is safe to say that this is the biggest event we have been planning for, as we were expecting around 500 people to come. This morning, while we were all sporting our study abroad T-shirts, we jumped in the van and left the hotel, excited for the day ahead. As we arrived, there was already a line of people by the registration table, and several were starting to get health information. Many people were drawn from our advertisements, and several people just stumbled upon the fair while walking through the town, as we were a lot of people in big tents in the middle of the street… kind of hard to miss. The glucose station at the fair. So, how about a walk through the heath fair? Naturally, the registration table was at the beginning of the tent. Here, people were able to get a card to keep track of the health information they were receiving. In the middle of the tent, there was a station for height, weight and BMI. This area proved to be a good place to talk to people about their diets, specifically portion sizes and healthy foods. A very popular station was the blood glucose table. Many people were either diabetic or had a family history of diabetes. While we did see some very high and low blood sugar numbers, a lot of people were within a great glucose range. In fact, many of the people who were more concerned about it actually had better blood sugars because they were very conscious about their diet, exercise, medications compliance and regular checkups. However, being a station with needles and blood, it was not everyone’s favorite. Thankfully, those who were nervous about the finger stick said that it wasn’t too bad. Another popular station was for blood pressure. As expected, we saw a variety of blood pressures and were able to give simple education about how to control blood pressure. Many people were anxious to get the blood pressure checked because they knew they were hypertensive and wanted to keep track of how their medication was working. On the way to the back of the tent, there were several tables with educational materials about healthy foods, disease processes and mental illnesses. One of the educational tables included pamphlets on prostate cancer, ovarian cancer and breast cancer, which we have been focusing a lot on sharing during our time in Grenada. It is really important for people to know that these cancers exist so that they can be regularly screened for them, as some can be asymptomatic in the beginning stages. Thankfully, many people seemed receptive to learning about these diseases. There was also an area for vision screening along the black wall of the open tent. Behind the back of the open tent, there was a closed area with curtains set up for breast exams. As mentioned before, this is a topic we have emphasized for the entire trip. It is such an important health topic, and we want both women and men to be aware of it. If any lumps or abnormalities were found during the examination, people were referred to a doctor for follow up. The health fair today was such a success and we were able to see many people. There are so many people who worked to make this all possible. We want to say a very special thank you to Ms. Hopkins, who has done so much for us on this trip and played a huge part in the health fair. We also wanted to say thank you to the University of Florida and the individuals who donated so many of the supplies needed to serve the people today. Without so much support from so many people, this day would not have been possible. We are grateful to have had this opportunity and feel very proud of the work done today. As days go by, we get more practice in our skills and knowledge and we feel more proficient. I think that this really showed today. However, we would be lying though if we said we weren’t tired. After the health fair, we were able to grab a few snacks from a sweets shop and went to the beach. It was nice, relaxing way to end a busy day. It’s hard to believe that we only have a few more days in this beautiful country. We plan to enjoy every last minute of it. The fresh coconut at the market. Although health fairs have been extremely fun and knowledgeable, today was a day full of Grenadian culture and fun! We woke up once again to our amazing patio side breakfast of French toast, bacon, eggs, fresh fruit and specialty Grenadian dishes. We loaded the van and were off for town. Our first stop was the market. The market was filled with spices, fresh fruit and vegetables, handmade sandals, candles, jewelers, amongst other beautiful creations. Each of us spent our own fair share of money indulging in gifts to bring back for friends and family. We each were captivated by the coconut stand where locals and tourists were treated with fresh coconut juice straight from the coconut, followed by the man cutting the coconut open allowing us to eat the inside. It was sweet but also very refreshing! The market is where most of the locals sell the fruit and vegetables they grow along with their most favorable spices, such as nutmeg. We learned that no chemicals are used in Grenada. They plant banana trees around the spice trees and those work as natural insect repellents. It was nice having one of the venders explain to us the many spices and what each were used for, like curry and lemon pepper for fish. After hours of shopping, we then loaded the van once again to head for the Seven Sisters waterfalls. Once again our trusty driver Garfield got us all the way up the hill that reaches 1,910 feet of elevation, and we had finally arrived at our destination. We approached the tour guide, Wayne (who happened to be 20 years old, so it was nice to talk to a local around the same age as us), and shortly later we picked out a bamboo stick to utilize (we all thought this stick was silly but slowly realized the intense need for this stick) and our tour started. Beginning the tour, Wayne quizzed us on the fruit trees as we passed by them seeing if we could recognize the produce. After a couple of minutes of learning about the trees and plants, our real hike started. We were all stunned by the intricate pathway that consisted of unsteady rocks, slippery clay (which a couple of us happened to slip on), and steep hills. Our handy bamboo sticks were definitely put to use during this time! The hike was close to an hour in total and midway through the sunshine went away and down came the rain. We slowly made our way through the slippery mud and made it to the final crossing. We crossed across a stream of rushing water and finally made it to the waterfall, our journey had paid off! We finally made it to the waterfall after an intense hike! We soaked up the scenery followed by a quick photo shoot and embraced nature. Some of us even decided to take a quick swim in a small pool of water near the waterfall. Deciding it was time to go, we then hiked back to the van, much more quickly and exhausted this time. Once in the van, we quickly went to the hotel to change and enjoyed a nice evening at the restaurant Umbrellas. Umbrellas is an amazing restaurant with great fresh food, such as fish and ceviche along with live music and a great view of the beach. We enjoyed dinner with great conversation and even better dessert. We are all sad that our trip is coming to an end but excited to take back what we have learned and share with others! Enjoying the view at the restaurant Umbrellas. 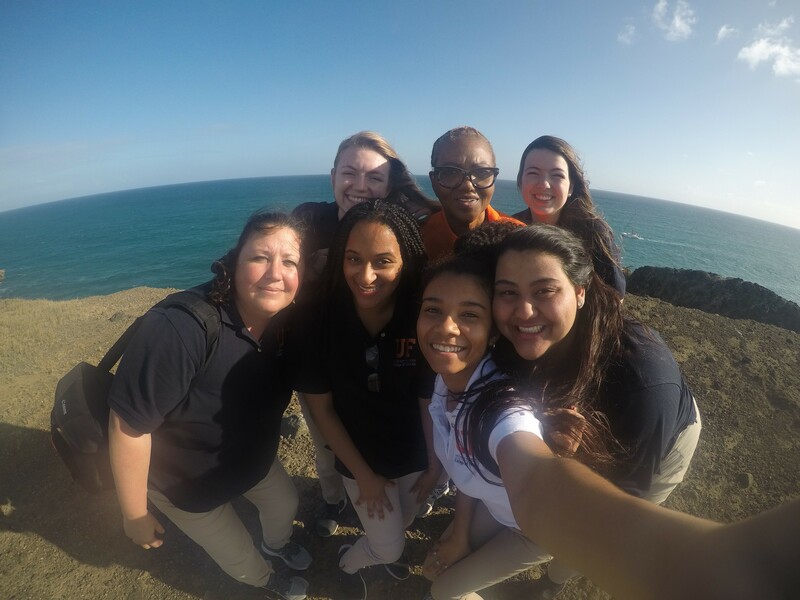 A picture with some of the outstanding ladies who made our trip possible and incredible! Today was our last full day on the island, and we’re all sad to leave this place we’ve grown to love so much. Home visits in Victoria were on the agenda for the day! Because we had not done home visits thus far, no one knew what to expect. Once we arrived in Victoria, we were put into three teams. 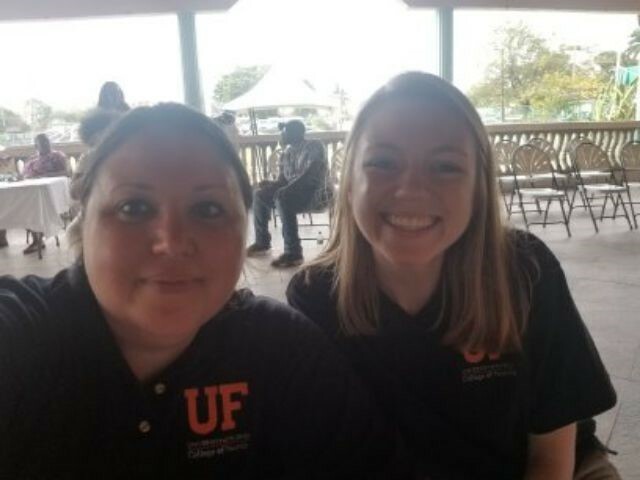 Each team was assigned a different part of the town and consisted of two UF nursing students and a couple of nurses who were familiar with the area. We loaded up our supplies in our backpacks (blood pressure cuffs, materials for testing blood sugar, paper, pens, hand sanitizer and water, of course) and visited homes in the community for approximately four hours. We traveled door to door checking to see if any of the family members wanted their blood pressure and blood sugar checked, and if any of the ladies wanted a breast exam. According to their results, we provided education when necessary. One of the UF nursing students taking a patient’s blood pressure in their home. We all loved that each house was a unique encounter – no two were the same. We got to examine people of all ages: the elderly, middle-aged adults and children as young as 5. The visits were such a great experience because we were able to observe the environment where our patients live, which sometimes helps us to realize why the individual is suffering from certain health issues. It permits us to view the patient holistically, which is not entirely possible when the patient comes into the hospital or a clinic. It was incredible to see how excited the families got to see us and then how they joked with each other about whose blood pressure or blood sugar was better! 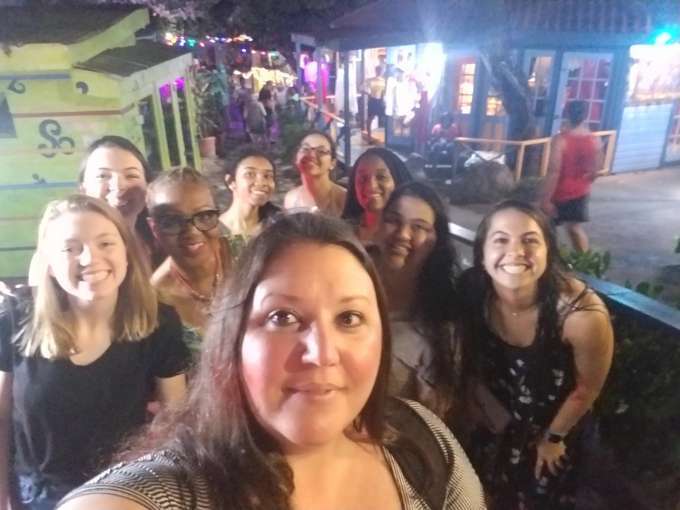 During our venture around the community, the majority of us were met with excitement as these families invited us into their homes, but this was not the case for all. One group stated that their community was resistant to our care and did not want to be tested. Instead, they desired to remain reliant on traditional remedies to improve their health. When we finished with our visits, we headed back to our meeting spot where a delicious lunch was waiting for us. A wonderful group of ladies had prepared roti, chicken, potatoes and salad for us. 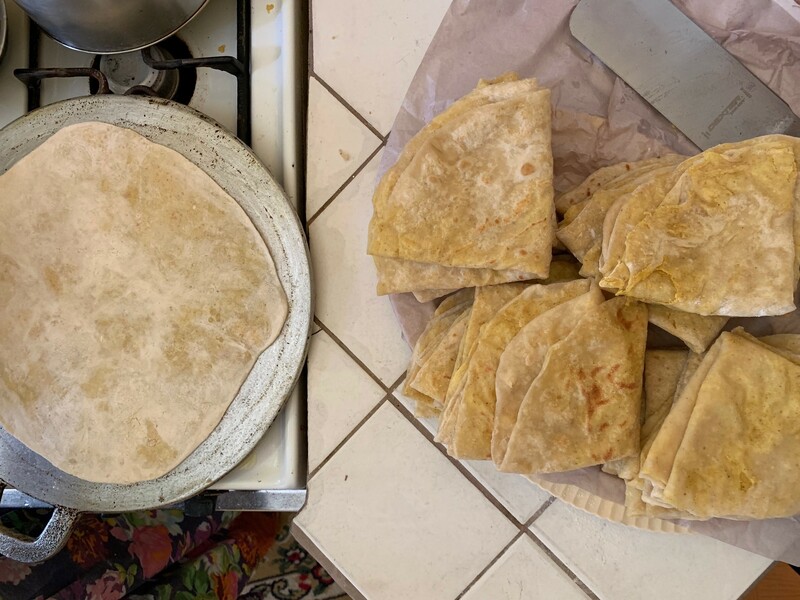 It was exciting to taste the roti because on my route, Marianna and I got to learn how the roti was made. When we went inside the home, the grandmother was in the middle of preparing the meals, and after we checked her blood pressure and sugar, she taught us the process to make it! Our group with our driver, Garfield. One last group picture at the airport coming home.